Memorial service for Corey Clifford Mark Lindsey, 30, of Cullman, will be at 3 p.m. on Saturday, March 30, 2019 at Cullman Heritage Funeral Home. Mr. Lindsey passed away on Friday, March 22, 2019 at his residence. He was born, November 07, 1988 to Mark Lindsey and Karen Clark. 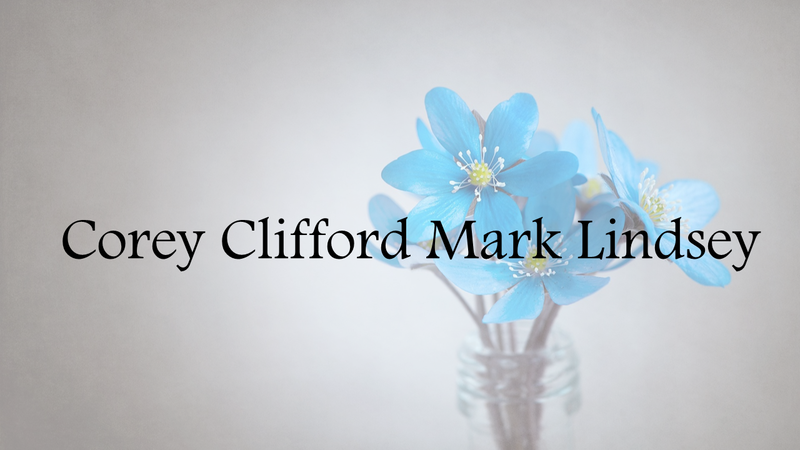 He is preceded in death by his grandfather's, Clifford Lindsey and Mark Clark. Survivors include his father, Mark Lindsey, mother, Karen Clark, sons, Ashton Lindsey, Deacon Lindsey, Wyatt Lindsey, and Westin Lindsey, sister, Cassy (Dustin) Dempsey, nephews, Kabri Hyde, Deegan Dempsey, and Kannon Dempsey, grandmothers, Linda (Kenneth) Walker and Zelda Lindsey, aunts, Tammy (Tom) Pyeatt, Melanie (Jerrold) Russell, and Brenda (David) McPherson, uncles, Kelly (Lori) Clark and Ricky (Trisha) Lindsey, and a host of cousins, family and friends.